When it comes to creating great articles, you need content that stands out. 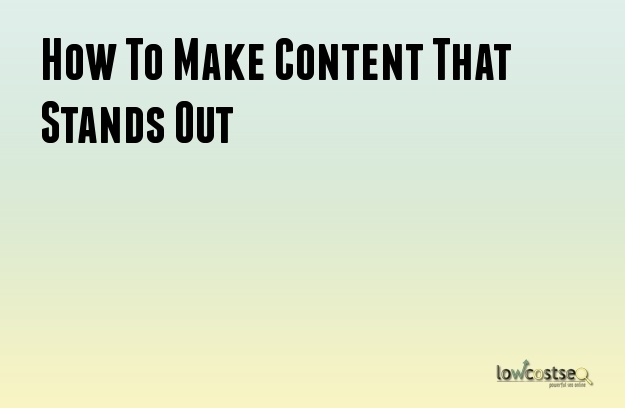 Your content needs to be something that people want to read. We’ve already mentioned how to create an SEO-rich title, but what about the articles and posts themselves? Here are a few things you need to consider when writing. As you will soon see, content doesn’t always need to be completely new ideas, researched from the ground up. It’s more important to engage with your audience and give them what they want. First of all, it’s important to ensure your content is relevant to the platform. While you might think this doesn’t make it stand out, it’s better to have something that makes sense, rather than something that stands out. You might have a refreshing, unique article on car design, but if the platform isn’t about cars, it’s unique factor is ultimately wasted potential. One way to beat existing content is to simply top it. This is similar to the idea of a skyscraper – if you want to be more impressive, than make yourself more visible – and this is how the method is most commonly known. This way, you don’t have to write something that’s completely new or ground breaking. Instead, why not offer something that simply offers more? While you could easily create bigger lists, such as “20 ways to...” rather than “10 ways to...”, there are more sophisticated methods. Look at what your competitors are writing about, as well as the general content in the industry. Are common themes cropping up, yet often missing pieces of information. If you’ve ever read something and felt that it could use expanding or exploring an aspect in more detail, this is where the skyscraper method can really shine. If audiences see you addressing more of their needs, then your content is going to do well. Similarly, your content can collect information from various other sources. A great article, for instance, might just be built up on existing research. While you can link to these sources for more information, your post will present a unified view that is worth reading in itself. Other methods include collecting gifs, videos and other forms of media into one page. This might not be a thought-provoking piece of content, but it certainly proves entertaining. Sometimes its better to provide creative content, rather than a traditional word-based post.